Tomorrow I’m leaving for Istanbul as the first stop in an interfaith pilgrimage to the Holy Land. This will be our third annual trip we’ve organized as part of the Wilshire Center Interfaith Council here in Los Angeles, and it’s unusual among interfaith pilgrimages in that it includes Jews, Christians and Muslims. After a few days in Istanbul, our group of 39 pilgrims will travel to the Holy Land, beginning with Sunday Eucharist in the Nazareth Synagogue Church, where Jesus began his public ministry. We’ll then walk over the the Basilica of the Annunciation for one of those wonderful eye-opening moments that we’ve come to expect: the Muslim pilgrims will be just as awed by being in the place of the Annunciation as the Christian pilgrims. Muslims hold Our Lady in great veneration, and we’ll hear the account of the Annunciation from the Qur’an. This is only one example of commonalities between the three religions that we’ll encounter along the way. One reason we’re there is to learn about what unites us as well as what divides us, rather than relying on assumptions. One of our central themes in this pilgrimage is our common heritage in Abraham, the father of all three religions. 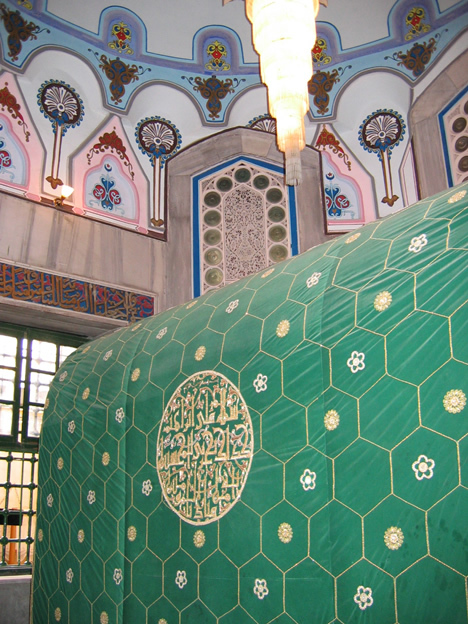 Here’s a photo of his tomb in Hebron that I took last year. Pilgrimage is a form of prayer common to all three Abrahamic traditions. From the time of the Second Temple and well before, the ancient Jews observed three festival pilgrimages when the devout would come to Jerusalem: Pesach (Passover), Yom Kippur (the Day of Atonement) and Shavout (Pentecost). For modern Jews, the concept of pilgrimage is expressed in the terminology of aliyah, or “ascent” to the Holy City. Christianity preserved the Jewish custom of pilgrimage. Among the chief places of pilgrimage for early Christians were Jerusalem, Nazareth, Bethlehem and Rome, the shrine of the apostle Peter. Later popular pilgrimage sites were the shrine of the apostle James in Spain and Marian shrines in México City and Lourdes (France) as well as numerous other sites that continue to attract millions each year. In Roman Catholicism, the Second Vatican Council (1962-1965) described the Body of Christ as “the Pilgrim Church,” learning from every culture we encounter as we travel through every time and place to proclaim the Good News (Gospel) of Jesus Christ. The Prophet Muhammad (peace and blessings be upon him) directed Muslims to practice pilgrimage (hajj) as one of the Five Pillars of Islam. The three major Islamic places of pilgrimage are Mecca (the site of Abraham’s temple to the one true God), Medina (the location of the first ummah, or Muslim community, where the Islamic tradition is considered to have begun in the year 622) and Jerusalem. Muslims are also known to make pilgrimages to the Catholic Marian shrines. Foremost among the Islamic places of pilgrimage is Mecca, which attracts millions each year, whose faith is renewed by this act of travel. So our pilgrimage is, above all, prayer. In this pilgrimage we do not practice syncretism (the idea that all religions are basically the same). We offer all pilgrims opportunities to experience worship in authentic Jewish, Christian and Islamic forms. At times they are challenged to participate in worship that is different from their own tradition. We encourage them to participate in those aspects they feel comfortable with and not to participate in those which make them uncomfortable according to their beliefs.